BROOKSIDE single-family homes on a Planning Dept. illustration. Nearly 50 Sycamore Square and Brookside property owners attended a December 19 public hearing about rezoning single-family parts of their neighborhoods to curb what many describe as “McMansionization.” The term refers to the construction of large modern houses on small lots in traditional single-family neighborhoods. Examples of such structures are obvious to drivers or walkers on the stretch of Sixth St. passing through the La Brea-Hancock community between Highland and La Brea avenues. 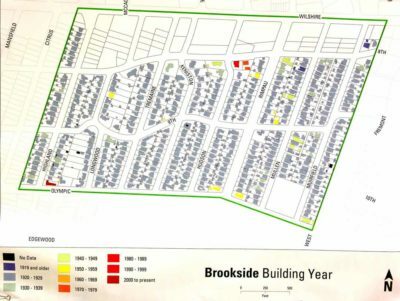 This article deals with the proposals for Brookside, which has vastly more single-family lots that will be affected by the proposed subzone adoption. Protecting the traditional homes in Brookside, the area generally bounded by Muirfield Rd., Olympic Blvd., Highland Ave., and Wilshire Blvd., has been an ongoing effort in recent years. Initial efforts began in the era of Councilman Tom LaBonge and included a proliferation of “Save Beautiful Brookside” lawn signs advocating that the city adopt an Historic Preservation Overlay Zone (HPOZ) designation for Brookside. After taking office in June of 2015, and after listening to considerable debate on the subject, Councilman David Ryu and his staff, in early 2017, proposed adoption of a Zone Change Ordinance that would implement new subzones designed by the Dept. of City Planning to provide protections for historic houses without the complications and time delay involved in adopting an HPOZ. A Larchmont Chronicle map published in the November 2017 issue shows the many adopted HPOZs and adopted and proposed “variation zones” in the local community, including for Sycamore Square and Brookside. Councilman Ryu and the City Planning Dept. say that the available variation zones apply tailored form and scale regulations to single-family areas to help ensure that future house development is compatible with, and enhances the existing character of, a neighborhood. At the formal public hearing on December 19, there was testimony in favor of different versions of the new subzones, with some speakers favoring the mass of new construction being allowed all over a lot, some favoring the front of a lot, but most favoring what the Councilman recommends — the R3 subzone that provides that the taller building mass is restricted to the rear of a lot. The proposal for Brookside also includes the addition of an “RG” (Rear Detached Garage District) designation that requires the required covered off-street parking to be detached from the main building and located at the rear of the lot. City staff had suggested the “V3” designation that allows for the taller new construction to be all over a lot. However, most Brookside community members who testified want the designation to be “R3,” the rear mass. This is the variation zone that was adopted for nearby Larchmont Heights, La Brea Hancock, Wilshire Vista and South Hollywood. An argument in favor of this R1-R3-RG approach was given by resident Jan Wieringa, one of the originators of the move to preserve the historic Brookside neighborhoods. Wieringa presented three explanatory photographs, and they are included as illustrations here. One photo shows the front of a Brookside house on Tremaine Ave. that recently was remodeled with a 1,500 square-foot addition that was placed at the rear of the lot, leaving the traditional, street-facing façade as it has been. Wieringa also showed an angled view of this new addition, viewed from the side-yard, noting that the remodeled house is an excellent example of what will result from the R1-R3-RG sub-zoning that she and many of her neighbors advocate for Brookside. In stark contrast, Wieringa also showed a photograph of recent new construction in Brookside, on Mullen Ave., that places the two-story massing all over the lot, with the new bulk being very noticeable from the front, although there is a “rear garage” off of the alley. Wieringa said this example is similar to the results that would come from adopting the “V3” subzone advocate instead of the “R3” subzone. Following public testimony, the hearing officer said the comments and any written communication received would be included in the report being prepared by the Department of City Planning for consideration by the City Planning Commission. The proposed zone change ordinance ultimately requires approval by the City Council.